If you want an effect on a sound just drag it over and drop it onto the sound. 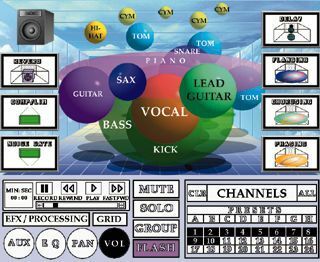 This window may be used to add an effect or processing to a sound as an Insert or using an Auxiliary Send. If using an Auxiliary Send, volume is still front to back. By dropping the effect on the sound it assigns the effect to the particular auxiliary send. To see the parameters, or settings, of an effect you click twice on the effect in the effects pallet on the left or right side of the screen in the effects window. To see the parameters of an effect — click on the effect below.